Congratulations to Dialysave, these passionate and committed students will make dialysis accessible to more people through an innovative and less expensive solution. Dialysave, created by McGill students with the help of mentors, doctors, professors and entrepreneurs, have developed a portable and inexpensive dialysis machine. This solution which is quicker and about 60 times less expensive than current methods, will allow more people suffering from chronic renal insufficiency to receive treatments. 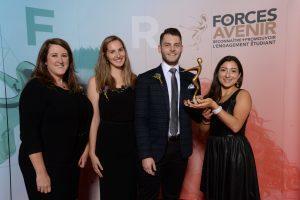 Picture from left to right: Élisabeth Reid, Executive Vice President of SIMCO Technologies and Anya Pogharian, Radu Alexandru Paun and Vivian Eberle, the winners in the Science and Technology Applications category. SIMCO is proud to recognize the outstanding achievement of students who have pursued exceptional projects. Congratulations to all the finalists for your commitment and perseverance in pursuing you’re your university studies and projects.